PTCL has announced one year Internship Program for the citizens of Pakistan. PTCL Internship Program 2014-2015 Online Registration NTS Entry Test. NTS Jobs are available for the citizens of Pakistan. 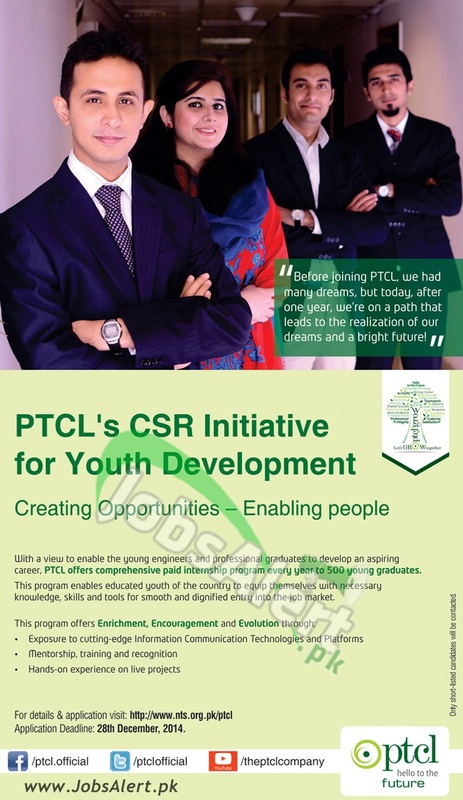 PTCL is looking to enable the young engineers and professional graduates to make their future successful and for this purpose PTCL announces Internship program every year and almost more than 500 young graduates take advantage from this opportunity. All those candidates who wanted to apply for this internship program must fulfill the criteria given below. Candidates from all over Pakistan fulfilling the criteria and having valid CNIC, domicile is welcome to apply for this internship program. In the following you’ll have complete information about the requirement required to apply. Candidates must possess qualification MCS, BCS (Hons), BE (Software Engineering). Candidates must have qualification MBA (HR/Marketing), BBA (Hons). Candidates must possess qualification in the field of Finance & Accounting such as MBA (Finance), M.Com, B.Com (Hons), ICMA, ACCA, CA Inter or 16 years equivalent degree/Qualification in (Accounts / Finance / Commerce). Candidates must have minimum CGPA 2.80/70% aggregate for Business, IT Graduates & Engineers. Candidates must have age limit between 18 to 25 years. Candidates who completed their studies in 2013 or 2014 are eligible to apply. The internship program is available all over Pakistan. Candidates may apply for the Internship Program via online at the official site of NTS or through web link given below. Last Date for submission of application is not announced yet. Test Date: 28th December, 2014.